The Short-tailed Shearwater, Puffinus tenuirostris, Yolla or Moonbird, commonly known as the muttonbird in Australia, is the most abundant seabird species in Australian waters, and is one of the few Australian native birds in which the chicks are commercially harvested. The chicks are caught in nets then put the bird in boiling water for a few seconds. 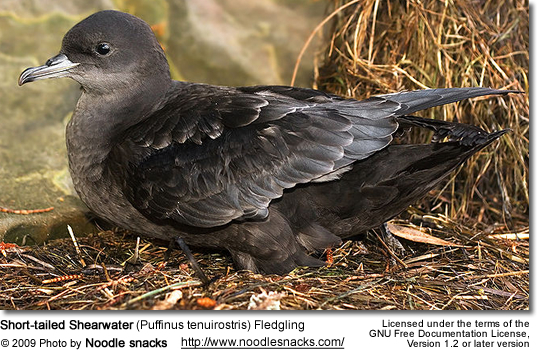 In New Zealand the Sooty Shearwater is the local 'muttonbird', and other harvested petrel species, such as the Wedge-tailed Shearwater, may be known as muttonbirds elsewhere. 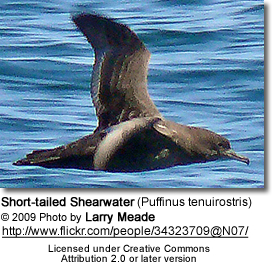 This species appears to be related to the New Zealand muttonbird and the Great Shearwater, all blunt-tailed, black-billed species, but its precise relationships are obscure (Austin, 1996; Austin et al., 2004). These are among the larger species of shearwater which might belong into a separate genus, Ardenna (Penhallurick and Wink, 2004). It is a migratory species that breeds mainly on small islands in Bass Strait and Tasmania and migrates to the Northern Hemisphere for the boreal summer. 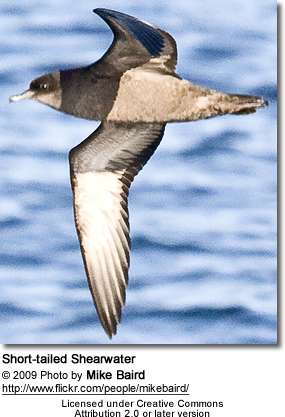 Each austral (Southern Hemisphere) winter, the Shearwaters migrate to the seas off the Aleutian Islands and Kamchatka. In the austral spring, they travel down the coast of California before crossing the Pacific back to Australia.